Home Reviews Drama Drama Favourites: Historical Dramas! It’s been a while since we published a ‘Drama Favourite’ and we believed it was high time we got back to you, with another set of dramas. This time, historical. South Korea has a rich and colorful history what with it’s Joseon era, Chinese and Japanese colonization and then the several years leading up to freedom and so forth. One of the favorites, of K-Drama screenwriters, is the Joseon era. Mostly because, this was the time that Korea started making an identity for itself. It’s people weren’t Chinese or Japanese, they were ‘조선 사람들 (People of Joseon, which also translates to Korean People). Going ahead with that celebration, here are some of our favourite historical dramas to watch, and re-watch! This list HAD to begin with the famed god of K-Dramas Lee Min Ho. It’s not a myth that every drama Min Ho touches, turns to gold; it’s reality. Faith was his first and only historical drama (till date, there might be a new one before this year ends) and it turned out so well! The drama revolves around the love story between a Goryeo era warrior, Choi Young, and a modern day plastic surgeon Yoo Eun Soo. When Princess Nogoog barely survives an assassination attempt and is on the brink of death, Choi Young is charged with the responsibility of jumping through a portal to bring the ‘magical doctor’. Instead, he drags Eun Soo from her modern world into the Goryeo period and forces her into a life of figuring out the ways of old medicine, Kings and warriors when all she really wanted was to become a famous plastic surgeon. It’s an interesting and heart-warming story about these two lovers, that transcends both time and space. Even though Choi Young is known as a war-hardened warrior with strong loyalties, he is tested time and again by the petty games in the palace, and even Eun Soo is wagered as a bait to kill Choi Young. Another historical supernatural drama, Gu Family Book stars Lee Seung Ki and Bae Suzy as it’s two leads. These two adorable dorks tell an ancient story of a half-human and half-mythical being who has to figure out his true ancestry so he can be with the woman he truly loves. What we really loved about this drama is the fact that it spans two generations. It isn’t just the story of Choi Kang Chi (Lee Seung Ki) but also about his father Gu Wol Ryung (Choi Jin Hyuk) the true mythical being who fell in love with a human girl. It is a painful love story, (prepare tissues before you watch) but it dares to cross so many social boundaries. It highlights the struggles of marrying out of one’s social class (even if it’s a mythical being in love with a human girl) and struggling to come to terms with one’s identity to truly love another. 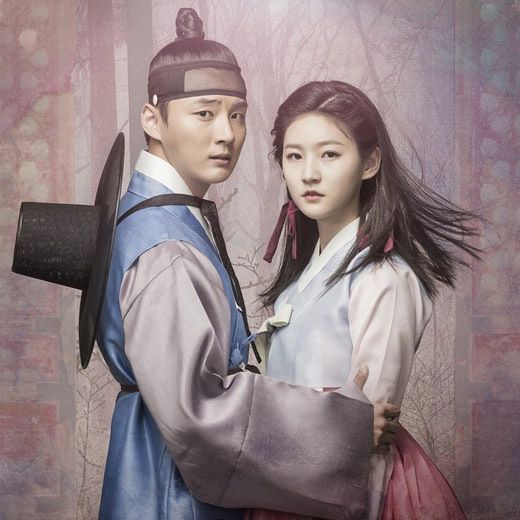 This twisted love story stars Yoon Shi Yoon and Kim Sae Ron in an interesting tale of typical palace drama with a hint of witchcraft and magic. The story follows cursed princess Seo Ri who was born out of her mother’s pregnancy led by a shaman. Due to the use of black magic during her birth, she and her twin brother, carried the marks of this black magic. Unfortunately, the Shaman transfers all of the curse into the princess and leaves her in the mountains, where she becomes a witch. All of this changes, when Seo Ri unwittingly comes across the royal physician Heo Joon, who grows madly in love with her. Together, they head on an adventure to rid her of this unjust curse and to take revenge on the shaman that put her in this predicament. This drama is a must watch if you go gaga over cool graphics and some pretty amazing white hair that Princess Seo Ri flaunts. Check it out for yourself, doesn’t she look great?! This drama is pretty much the gateway historical drama for all drama lovers. If this weren’t on the list, We’d probably receive some serious hate. Lee Joon Ki plays the famous night scholar Kim Sung Yeol who is a scholar by day and a vampire by night. His female lead/romance is Jo Yang Sun (Lee Yoo Bi) who is a woman cross dressing herself as a man to escape from loan sharks. A vampire that is educated and is secretly a mastermind that’s out to get his long time rival? A young poor girl who captivates the heart of this scholar, who doesn’t know that she’s a woman? Seems like a pretty commonly used trope in the historical K-Drama world and that’s why it works. Personally, I couldn’t get through most of the drama due to how it plays out it’s plot, but don’t take my word for it. Give it a try! If only for the fact that Lee Soo Hyuk plays the villain, and what a handsome one he makes! From Joseon, we are back to Goryeo with this drama. It stars Lee Joon Ki, IU, EXO’s Baekhyun, Nam Joo Hyuk, Ji Soo and Kang Han Eul (A lot of our personal favorites) and that’s definitely why this drama made it on this list. Though a good drama is ultimately made by it’s good plot, it survives in its ratings purely because of it’s cast. With such a spectacular and famous cast, who really wants to know the story at all? Okay, maybe some of us still care about the story. This drama is loosely based on the story of Gwagjong who is a famous king in the history of Korea, for having killed all of his family and his subjects, to ascend the throne. (It’s beginning to sound like Aurangzeb isn’t it?) But, if you put a modern-day girl who accidentally time travelled right into the mix of this, it changes a few things doesn’t it? We don’t know! Figure it out with Hae Soo as she tries to figure out which one of the 9 princes will end up becoming the infamous Gwangjong, while trying her best not to alter history. But when someone you’re in love with, could possibly become the most cruelest king in the world, wouldn’t you want to change history? If you’d like to take a look at previous segments of this series – Drama Favourites: Medical Dramas, Drama Favourites – Rich-guy Poor-girl dramas. Previous articleFormer 4MINUTE Member Jihyun Signs with New Agency!